So, Faith Ponsonby and I offered our services to the BHS as volunteers on their various stands and what fun we had. We started in the Carlton Hotel near Dublin Airport as with a very early flight to Bristol Thursday morning, the decision was made that driving up to the airport in the early hours of the morning, 3am, was not an option if we were to be fresh and on top form. The Carlton did us proud but unfortunately it did set the bar rather high for our B&B in Chippenham!! We collected a tiny Fiat, promptly named Cherry and set off. Due to some flaws in our navigational skills we saw a great deal of Bristol!! However, we now know where the University is situated and the Cathedral. 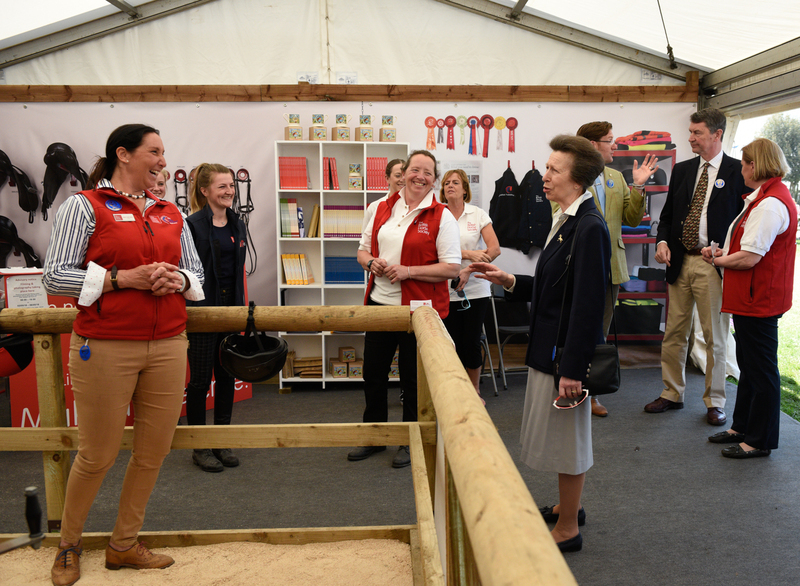 So, on arrival at Badminton we were in time for the BHS Debate, some very interesting points were debated and gave food for thought and talking about food the Lunch in a very smart tent for The Fellows & F&I Association was just fabulous. Beautifully served and very tasty it was a welcome meal as the B&B breakfast was not particularly appetising looking. After watching some dressage tests, we changed into glad rags as courtesy of Jenny Ham we were guests of hers at the Badminton cocktail party. OH WOW!! What fun, what a house & what wonderful paintings and garden. I did manage to scoop my jaw up off the ground on a regular basis especially as we bumped into Mr BHS Himself, David, and the Lovely Sam York – in a frightfully posh frock. We ended the day with a most delectable meal in a friend of Jenny’s horsebox. Friday dawns, getting hotter, and this is ‘our’ day for shopping catching up with people and again watching dressage but first a F&I Committee meeting. Then a slight deviation as we walked the course with Nick Turner on the F&I Course Walk so ably organised by our Vice Chair Ann Bostock. Well now I say course walk with some reservations as to my little collected walk Nick is on a huge extended walk needing me to frequently break into trot. There is an ‘in depth’ report on this on its way. We were able to present to the BHS, as Charity of Badminton, £300+, not bad ladies & gentlemen thank you and my thanks to Nick. Saturday, and we are to work on the stand with the mechanical horse. YES! That’s it no more mucking out, grooming, shoeing bills I’m sold on Henry. We had such fun helping people to improve their balance, for some a first time sit on a ‘horse’ and for others the chance to practise the flying changes under Faith’s tutelage. Having walked the course, the previous day we decided to watch some of the riders on the big screen and then we made our way to the Lake found ourselves an extremely good spot and drank in the atmosphere and excitement. No, I did not imbibe in the alcohol as I was in charge of Cherry. We saw Mark Todd, Oli Townend and others tackle the fences in and out of the Lake, including the one horse who having deposited his rider decided to ‘lock’ on to the picket fence and so nearly jump into the private enclosure, being turned by a nimble jump steward just before take-off. A frightening experience but also interesting as I was taken back to the BHS Convention when both Chris Bartle & Sam York were talking about watching the horse as he ‘locks’ on to his fence. Sunday, last day, and again we were helping in BHS tents, Faith back with the mechanical horse and me making teas & coffees!!!. We had to leave at 1pm so when we had seen the course jumped once we were happy. Well done BHS. 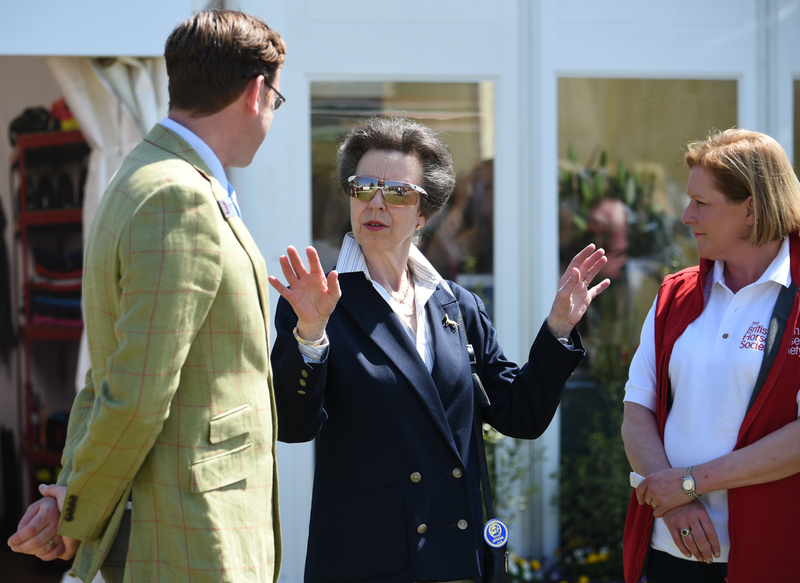 We were proud to be part of your Charity fund raising at Badminton Horse Trials. Brilliant advertising from when we first drove on to the field, along with all the various stands, coffee places and the new travelling classroom. So many hard-working people from all the BHS departments as well as other keen volunteers. Jillie Rogers BHSI Fellows & Instructors Association Chair. The F&I Badminton XC Course walk with Nick Turner, kindly organised by Ann Bostock, report written by Charlotte Tarrant BHS Stage 5 Performance Coach. This year the XC at Badminton ran in reverse to last year however it still started in the main arena with the traditional flower box. It’s not a challenging fence but horses and riders must stay focussed. As the horse and riders exited the arena they went left, through the collecting arena and across the road to fence 2, the “Rolex Feeder” which was a decent sheep feeder. This is where the group met Nick where he explained that the ground has been wet and as it dries at Badminton it becomes tacky and holding so riders seeing long strides might find their horses do not jump out. We were then off and were hot footing it across the course! We went past fence 3, “Horsequest Hump” and walked straight to fence 4ab, “Horsequest Quarry” here we paused for Nick to explain the fences. At fence 3 which is a new jump at Badminton the combinations are given a bit of a wake-up to help them set up for things to come. It was a mound with a lovely tree on the top and a bold forward approach was needed. Fence 4a was over the upright wall which dropped down into the quarry followed by a turn left and up the steep incline over another upright wall for 4b. Nick liked this as it was a confidence building combination. The striding wouldn’t be a problem as horses jump so well off the rising ground. Off we went again to fence 5 the “Rolex Grand Slam Skinny”. This fence could be ridden with various approaches, but Nick suggested hugging the rails around the tree and jumping the jump (a narrow-curved brush with a ditch in front) on the angle – easy! Fence 6abc, the “Irish Sport Horse Huntsman Close” here we had a look from both sides to see just how acute the angles were for these tree trunks. To get to Huntsman’s close there was a bit of a run down from the previous fence, here Nick said riders would need to set up to break their speed and jump “A” on the angle to help take time to jump “B” and “C” the real acute angled logs on two strides. There were options here, but Nick said these would take seven hours to do however he could see it causing issues later on. We very quickly marched off and passed fence 7 on the way to fence 8 to get ahead of the enormous group that were on William Fox-Pitt’s walk. Fence 7 the “Traders Table” was a BIG table, Nick said this was a decent 4* fence and that it has a bit of a kink in it and a downhill approach, so riders need to get horses heads up! Fence 8, the “Wadworths Water” was a hanging log on the angle over water. Here we were told that as you come up the hill it is smaller than you think but anything that’s a little cautious here you should kick on. It sets the tone for things to come next at the lake and that a left of centre approach was best. On landing into the lake riders would come out and canter around the edge to the main water complex at the lake, fence 9abc. 9a was a decent log dropping into the lake, Nick said riders will have to ride positively on a ¾ turn in to help keep the hind leg underneath the horse. Recover on landing from “A” get the engine going, five strides and pop the brush in the water for “B” then 3 to 4 strides to an acute angled skinny house for “C” which was up the bank out of the water. Nick emphasized that is the plan, but riders should expect anything, and you always go for “plan a” unless you feel it isn’t right and then you take the options. Always ride the line and power rather than stride and if you can keep them connected you’ll be fine. From landing over element “C” riders curved right and headed towards fence 10, the “Mitsubishi L200’s” these aren’t difficult but need concentration. Riders then go back along the lake and must set up a left turn and over the “world Horse Welfare Gates” for fence 11. In Eric Winters report he says, “if they can’t jump a 1.20m vertical at any place on the course than they aren’t a 4* horse”. Horses and riders then head up the incline past Badminton house towards fence 12 “Formulate! White Oxers” here there are two to chose from, Nick said jumping the one that comes up a bit earlier on the right would offer a better jump as horses can read them.We continued our march along the course to fence 13 the “Stick Pile” this jump in itself is lovely however nick said it is in the wettest part of the course so if riders see a long stride they may not make it out of the ground. On landing the ground gently slopes away down towards fences 14-16 inclusive, the “Outlander PHEV Mound”.